THIS PAPER HAS BEEN PEER REVIEWED AND PUBLISHED BY THE JOURNAL OF ROBOTICS AND BIOMIMETICS, JULY 29 2015 EDITION. The hook as a shape occurs very early on the evolutionary scale. Cellulose appears as a biological building block in the Cambrian age from fossil records and hooks have been found in chitinous organisms as mandibles, maxillae as well as tarsii. Hooks associated with plant seed and fruit dispersal, with relatively long-shafts and short spans have been identified in four species by S N Gorb. A fifth, Arctium minus (or Burdock as it is commonly known) is purported to have been the source of engineering design inspiration for George de Mestral (see Velcro). There are marked differences in the shape and functionality of natural A.minus hooks and the probabilistic fastener that he designed and developed, namely the needle-like insertion of the A.minus hooks and their lack of reusability. 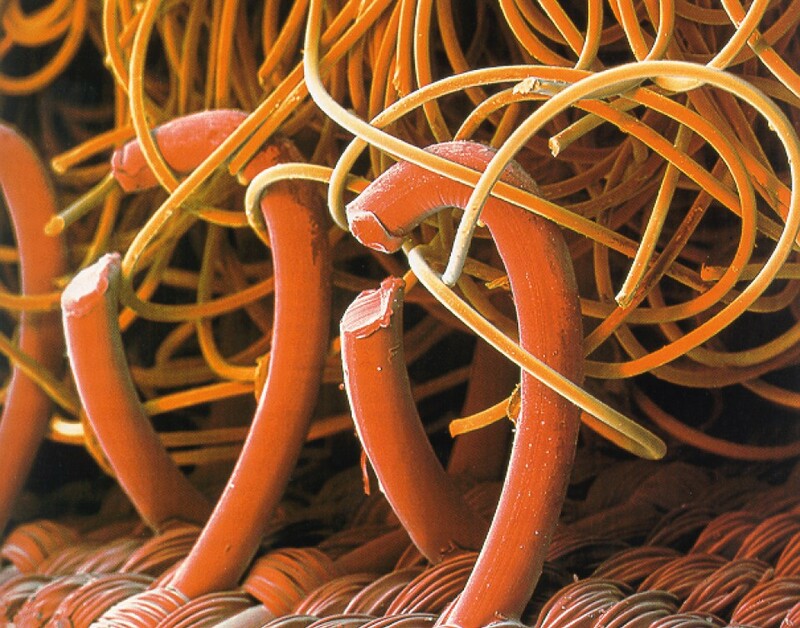 In functionality, Velcro resembles that of C.lutetiana. The variety of long-shaft cellulose hooks supports its potential for design applications for attachment to material substrates. 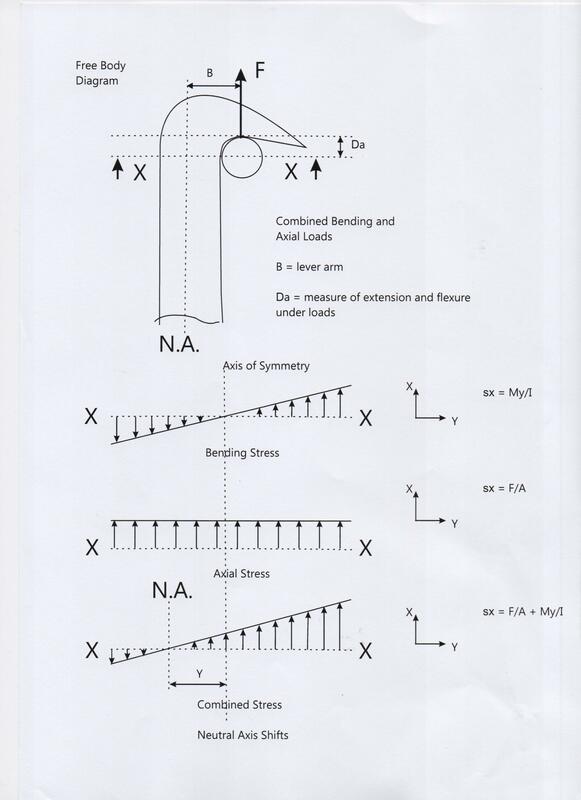 From study of S N Gorb’s data it is concluded that there are additional indicators for structural behaviour as well as the morphological variables indicated by Gorb and these are flexible versus fixed bases to the shafts and degrees of resilience of the component material. The natural substrate properties are presented as being indicative of the receptiveness of the hooks to a range of substrates. Field testing consisted of tensile testing mounted A. minus hooks in an Instron tensile tester in a laboratory to note the fracture strength (contact separation force) and mode of failure which was characteristic of a composite biomaterial. The study indicates that contrary to Gorb, the reduction in the size rendered the bending moment due to the hook span to be negligible and of little effect. Note that the original paper on A. minus is missing presumed lost from the British Library and that finite element analysis follows in paper III, confocal microscopy in Paper II. Library. A. minus (Figure 1) is a species of plant that supports hooks for the purposes of seed dispersal that was omitted in his study of scaling effects ‎ in biological hooks and it is studied here. Further, after the study of the G. aperine hook ‎, the hook of the A. minus is studied to identify any salient biological design indicators that could give rise, biomimetically, to the development of a new product with the necessary references to DFM. Arctium minus with mm scale bar, showing the single order of freedom arrangement of hooked bracts overlaying each other. The question of intelligent design and perfection in plant hooks associated with plant reproduction is taken to have been addressed by the work of Allmon and Ross as cited by Nicklaus ‎, Howe and Smallwood‎ and by S H Bullock ‎ and it is therefore sufficient to merely state here that for the purposes of structural biomimetic study, plant biological structures must be treated as they are without regard to their origins or reason for being and examined for design indicators that can be utilised for the purposes of modern design and manufacture. To assume perfection in Nature’s design is a fallacy. All that can be assumed about Nature’s designs is energy efficiency with available materials. However in seeking a design indicator, successful structures that are present in more than one species are a point of departure for study from Nicklaus’ analysis of the evolutionary process (i.e. the structures have passed through the “evolutionary sieve” in more than one species – an indicator of success.). S N Gorb states‎ that at the time of his writing, there were no commercial lightweight attachment mechanisms that exhibited a flexible base as he found in the case of G. aperine (multiple-degrees of freedom). This can be expanded to include probabilistic and fields-of-hooks fasteners. Species he studied that support hooks were A. eupatoria, C. lutetiana, G. aperine and G. urbanum. These hooks are not formed through the process of adaptive growth since they are single-use. They therefore must be genetically defined to occur in their shape. Interaction with the environment changes their qualities in a genetically predefined manner. The distinct difference between these hooks is the structures from which they arise; G. aperine hooks are stomatal in origin as are those of A. eupatoria and C. lutetiana while the hooks of G. urbanum arise from carpels. Only the hooks of A. minus arise from modified bracts encasing the ovary. D’Arcy Wentworth Thomson’s book “On Growth and Form” ‎, devotes a chapter to scale effects. In the case of natural hooked structures, many of the examples in Nature are so small (~100mm in thickness) that scaling factors become significant in the action of attachment. It is common to find that it is a combination of properties that act coincidentally that produce an effect ‎. Adhesive secretions, other fluid properties such as surface energy and capillarity and applied pressure gradients combine with mechanical interlock to produce a resultant attachment force. Gorb notes ‎ that biological systems present the material scientist with goals for new materials that can model the behaviour of biomaterials and this work anticipates advancements in artificial cellulose. The burdock hook (radius of curvature ~ 250mm, shaft diameter ~ 200mm) is desiccated when mature, without any secretory organs. The full action of mechanical interlock can take place in both a wet and dry environment thus the scaling effects are limited to those of size, friction, moisture, inertia and gravity. It can be predicted that there will be a problem using conventional rapid prototyping devices to judge their performance due to their ability, or rather, their inability to reproduce resin models in the order of size of less than 100 microns in thickness which is necessary in order to reproduce any scaling effects observed in the biological sample. 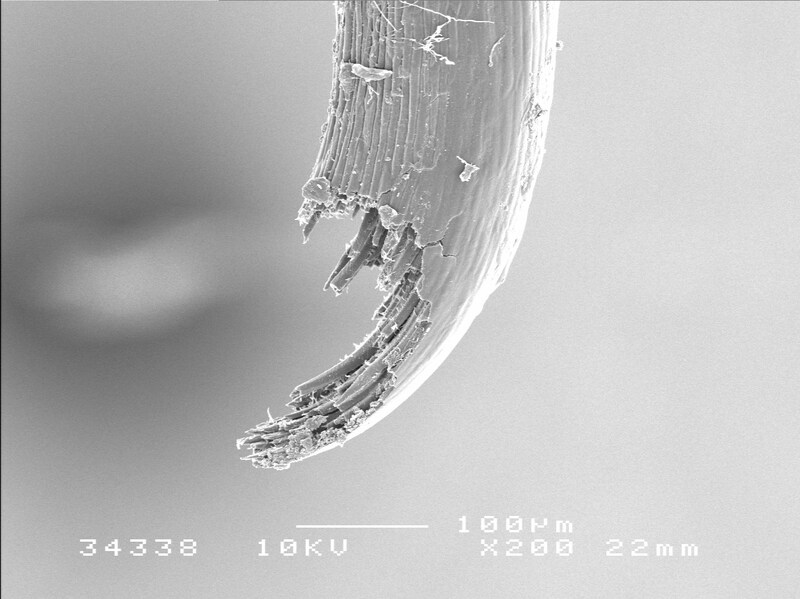 A typical deposition prototyper deposits nylon resin in layers of 100 microns, about half the burdock shaft thickness and further the material lacks properties analogous to biological materials ‎. Similarly commercial FEA tools such as Solidworks 2004 lack facilities for composite study. Higher plants use a variety of dispersal agents such as wind, water, animals and people ‎. Dispersal by animals is known as zoochory. The dispersal of seeds or fruit (known as diaspores, more often fruit than seeds) by attachment to animal fur or feathers is known as epizoochory. Diaspores of this kind do not provide valuable nutrition to the animal to which they attach themselves nor do they actively attract animals to parent plants. Instead they have special structures such as hooks, barbs, burrs and spines or sticky secretions and they detach easily from the parent plant. A.minus is commonly known as burdock and it is found throughout the UK and is a member of the Thistle family. It is common knowledge that it is an annual noxious weed commonly found by the side of pathways and riverbanks. It grows approximately to 2 meters in height and generally features single or multiple primary stems off which arise secondary and tertiary branches. In fur and feathers the diaspores may remain attached for a long period of time until animals groom them off or until the animal dies. A. minus has natural symbiotic partners in seed dispersal that are wild animals and birds indigenous to the UK, such as rabbits, badgers, foxes, sheep and deer. The diaspores of A. minus are adapted for dispersal by mechanical interlocking. Each of the bracts is flattened at the base where it originates, becoming narrower to form the shaft of the hook. Therefore each hook has a single degree of freedom which, Gorb ‎ says decreases the contact separation force and increases the propensity of the fruit to attach because the ability to bend implies weaker and flexible cell structures yet a greater ability to become attached in a probabilistic manner. This is not the case for A.minus. As the plant and its seeds mature the entire plant desiccates and becomes brittle. The detachment forces required from its supporting stem for the now brown fruits and the mature seeds they contain reduce to loads far below that of the fracture forces of the hooks and the fruit freely attaches itself to passing host. This is a one-off attachment. Once the fruit makes contact with the ground it is ready to await germination. Due to its narrow profile, the burdock hook has a further function, namely an insertion effect. It enables the hook to pierce fibrous surfaces like a needle and this could be an important indicator in later design work. The behaviour of the A. minus hook under loading is studied here. The hook is composed of the bio-composite cellulose which is comprised of cellulose fibrils bound together in a matrix of hemi-cellulose and lignin, ‎ and ‎. The substrate, because it forms one half of the attachment system for these types of hooks, must be accounted for in a study for the purposes of producing a product. The question that needs to be answered is the overall effect the substrate fulfills. In terms of the host substrate being fur or feathers, the qualities of these substrates have been studied elsewhere for other purposes. ‎Table 1: the diameters of some common natural fibres below). Hair is made of keratin. Keratins form a group of varied proteins which contain significant amounts of sulphur cross-linking and stabilizing in the material. It is found in horn, hair, hoof, feather, skin, claws etc. The types of keratin include mammalian, avian and others such as reptilian ‎. This can be related to the inner radius of the hook in order to seek design indicators of an optimum ratio. Such experimentation can be left until later in the product design but for the moment it should be mentioned that the span of the burdock hook, from outer tip to inner shaft surface, is approximately 250 microns and this can be compared to the above figures (see ‎Table 1) . The most important aspect to note with reference to the functionality of A. minus is not a critical geometrical relationship between the hook and a particular fibre but the fact that the hook accepts all fibre diameters for the purposes of mechanical interlock i.e. it is non-specific. 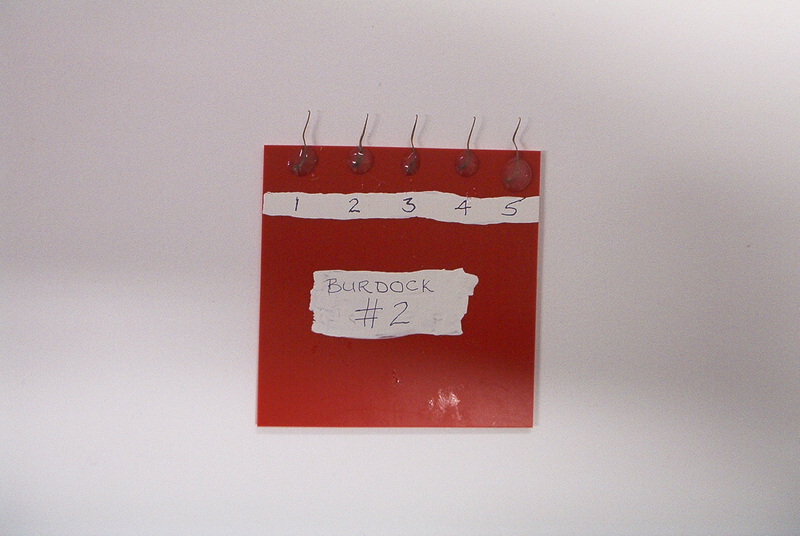 The testing of the burdock hooks occurred in laboratory conditions. 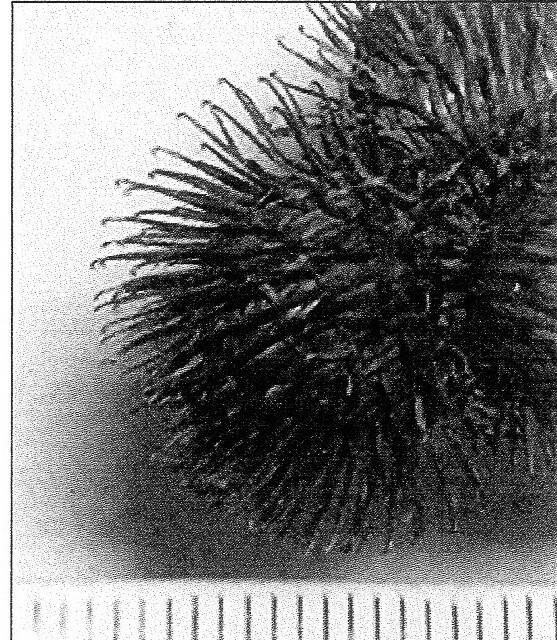 The hooks of burdock fruit were harvested a month prior to testing and stored in a dry condition. The purposes of this experiment were to study the material behaviour for the purpose of designing a product. Certain aspects of the bract’s behaviour were isolated for the purpose of the experiment whilst others were suppressed. The detachment force of the fruit from the stem, the extension of the hook prior to fracture and the force to remove the hook from the fruit; these were all suppressed for the purposes of the experiment. The first and third because they were irrelevant to a product study and the second because the hooks were all naturally curved prior to tension being applied making it difficult to isolate true extension due to material deformation from extension due to the taking up of slack. Further, standard values of Young’s modulus for cellulose (7-15 GPa from ‎) were used. This was not an experiment to determine the Young’s modulus and measured strain was not relevant to the test. “Contact Separation Force of the Fruit Burrs in Four Plant Species Adapted to Dispersal by Mechanical Interlocking” E V Gorb, S Gorb ‎. These two papers yield fundamental descriptions and conclusions upon which the following experiment is based. Their investigation into scaling effects in small hooks led to the following assertions: the four main attributes that influence burr performance are span, structure, size and material flexibility. All four species tested were found to exhibit behaviour within the known bounds of cellulose performance. (E = 7 – 15GPa). The significant difference detected was an unforeseen weakness in strength displayed by C. lutetiana. This was associated with an increase in material flexibility; the hooks didn’t fracture, they flexed to release the loop and the hooks remained intact. This form of response is very similar to that of commercial Velcro and would indicate that Velcro better approximates the behaviour of C. lutetiana than A. minus as is commonly asserted. The Instron tensile tester was equipped with a 1N loadcell. Each fruit was sectioned into halves under a dissecting microscope. One of these halves was returned to the specimen packet in case more hooks from the same specimen would be required. The other hemisphere of bracts/ovary/seeds was separated to yield individual hooked bracts for experimentation. Gorb states that the shaft length is the principle main morphological variable influencing a hook’s strength. Thereafter, hook span and material flexibility are most important, his theory being that the larger the span the greater the lever arm of the bending moment and the stress at the shaft. In this case material composition is constant for all the hooks. 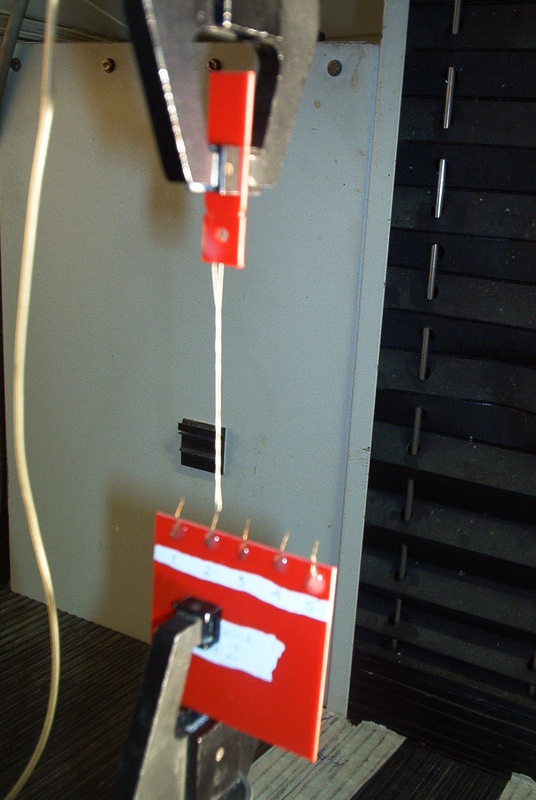 Figure 3 – Hook Testing in the Instron Tensile tester. Arrow indicates looped thread. Hook testing in the Instron Tensile tester. The results of the tensile testing are tabulated below (Table 2). Up to nine sample hooks were taken off of six fruit. 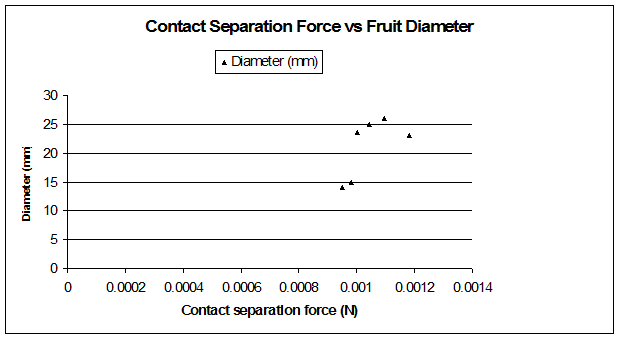 The mean value of these results for each specimen is plotted versus the diameter of the fruit (Figure 4). The results of this tensile test were directly compared with the values obtained by Gorb in his paper on contact separation forces. 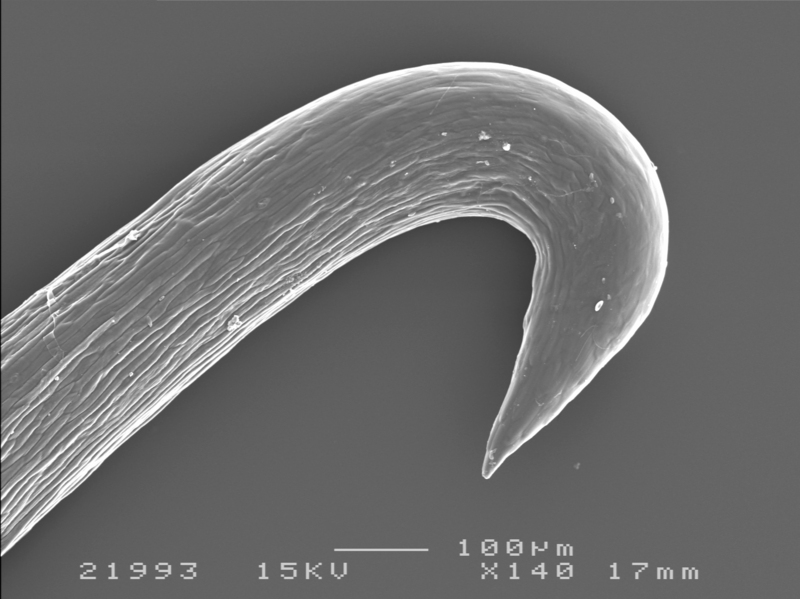 In his experiments the species with the lowest contact separation force is C. lutetiana, the species whose hook functionality most closely matches the flexible hooks of Velcro which are flexible in order to meet the demand of multiple usage in the product with the minimal of damage to hook and fibre substrate (for clarity note that there is a difference between flexible bases and flexible hooks – in the first instance the whole structure moves with the flexing of the base, in the second only the arch of the hook flexes). Comparing the force results obtained for A. minus with Gorb’s results shows that the magnitude of the results for A. minus fall between those of A. eupatoria and G. urbanum but are significantly higher than the other species with a flexible base, G. aperine. Certainly in terms of order of magnitude the tests would seem to reflect a fair result. That is, in increasing cellular complexity and thickness. Gorb’s investigation into his four hooked species was to investigate the correlations between contact separation force and various morphological variables. The G. aperine hook was of interest to Gorb since these hooks were distinguished by their hollow base and high degree of flexibility in all directions. Flexibility is also found in A. minus with the flattened bract at the base of the hook. In terms of statistical analysis, Gorb used ANOVA based upon ranks to compare the variables of the four species and investigate the correlations. In the case of this experiment where a single species is investigated it is suited to use a direct comparison between the load values of his paper. A simple form of scale measurement is used, that those hooks that originate from a large fruit would be proportionately larger than those from a small fruit. This is in fact obviously true from visual inspection of the specimens. The SEM images of the fractured hooks in ‎Figure 5: overleaf clearly show the fibrous nature of the hook material. The fracture surfaces are of interest. As will be seen in Part II, the hooks all have a thickening of the outer surface in the early curvature of the hook which will resist bending and compression, inducing fracture instead of bending. This effect is visible in the images. The composite nature of the material is clear and it should be noted how the fracture surface fractures unevenly and there is fibre “pull-out”. From ‎, fibre “pull-out” indicates that the fibre/matrix interface of the plant material consisting of cellulose microfibrils, hemi-cellulose and lignin is tightly bound. It can be seen from ‎Figure 5 that all 4 specimens (taken to be typical examples of fracture in the specimen set) experienced failure on the inner curvature of the hook as would be expected for a hook of material experiencing a bending moment with the inner fibres under tension while the external fibres are in a state of relative compression about a point of rotation. More importantly for a hook shape the inner fibres will be shorter than the outermost fibres therefore strain will be highest in the inner fibres. This means that the tensile forces in the inner curvature and therefore induced shear will be higher than the fibres in the outer curvature. The surface is typical of a fibrous composite break in bending. All hooks fractured at the region of the join between hook and shaft which is the region of the entire hook structure (both shaft and arced tip) that experiences the largest stress when the hook is placed in tension, noting that the bract itself is secured by glue. At no single instance did any of the test hooks fail at the bract. It was noted that there was a difference between the diameter of wire used by Gorb and the silk thread of this experiment (of the order of x10). Both the wire loop and the silk thread represent an artificial substrate, replacing natural fibre. Silk thread is a composite of natural silk of which each fibre is much finer than fur fibres. The wire loop appears much finer than a natural fibre and the question should be asked if it contributed to severing the hook tips. The analysis that follows derives from undergraduate engineering structural analysis. Note that although cellulose is a biocomposite, the density of the fibres in the fibre/matrix composite is such that for the purposes of analysis the hook material shall be treated as an isotropic solid. This is because the hook fibres are loaded in direct stress only. The basic morphology of the hook shall follow in the diagram of ‎Figure 7. Dimensions for the purposes of the 2-D analysis, for the hook are taken from the SEM (‎Figure 6). FEA follows in Paper III. 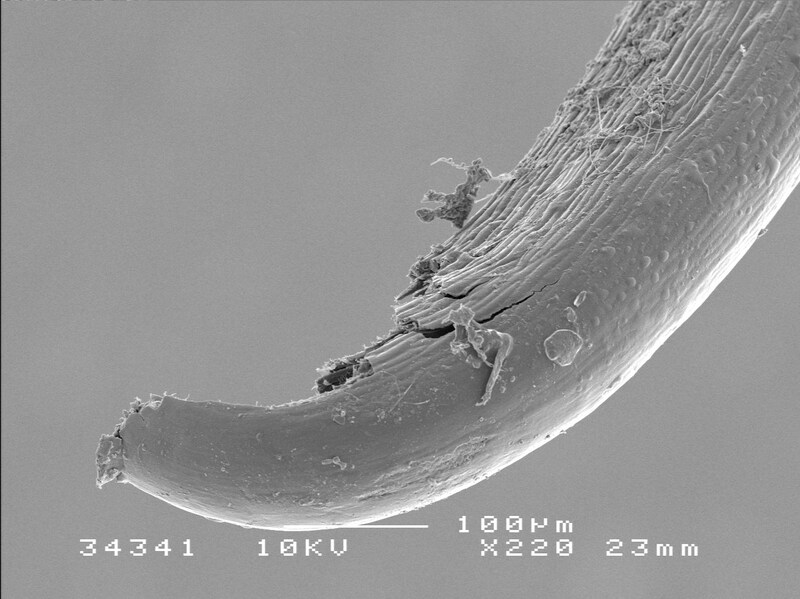 Figure 6 – An SEM of an A.minus hook reproduced from Part I and an SEM of a fractured hook that appears later on in the results. 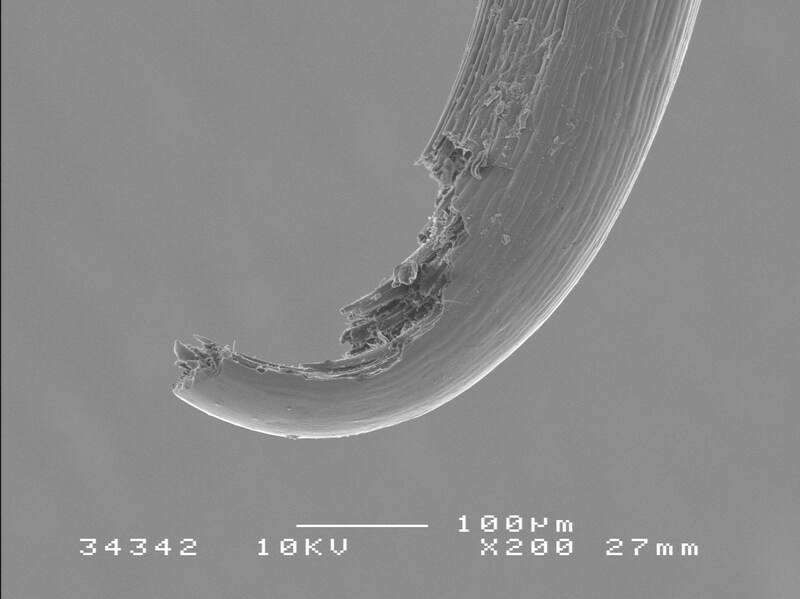 An SEM of an A.minus hook and an SEM of a fractured hook which appears again later in the Results. It has been noted previously that visually the A. minus hook does not taper in diameter from the top of the shaft. There is an increase in material on the shoulder of the hook before it tapers to a point. This influences the hook’s behaviour in tension, increasing its resistance to flexing, increasing its attachment to its host and its disposition to fracture, not bend. The analysis of a 2-D hook under loading is completely presented in Fenner ‎. Vincent has presented standard figures for the elastic modulus of cellulose as 7-15 Gpa and notes that for biomaterials the Poisson ratio is generally taken to be 0.5 (though not always). where the area is the cross-section of the hook perpendicular to the longitudinal axis. where Iyy = the second moment of area of a circle about a neutral axis y-y and yNA is the distance from the neutral axis to the edge of the section. Bending stress at failure is negligible compared to direct stress. Now by substituting each of the range values of E = (7-15GPa) for cellulose we find emin and emax. These results suggest that the bending moment has a negligible impact upon the failure in direct stress. Therefore there is a scaling effect such that the span of the hook becomes of little consequence relative to the material properties of the hook. This has a direct impact upon DFM. Then G = E/3 = (2.33Mpa, 7.5Mpa), minimum and maximum values of G, the Shear modulus. From this we can derive a minimum and maximum shear strain. This suggests that the hooks fail in shear induced due to the direct stress, seeming to confirm this hypothesis that cellular complexity and strength could be of higher consequence upon contact separation force than the relative lever arms and other mechanical morphological variables. The specimen fruit size ranged from 14mm to 26mm in diameter. It was measured that the sizes of hooks did not increase proportionally from fruit to fruit, including shaft length and span. Sample hooks were taken from different positions on the spherical fruit. With reference to ‎Figure 4: (the graph of fracture forces) it can be seen that the hook fracture forces are all of the same order of magnitude but that there is a levelling of the slope in the region of the diameter equalling 20mm. The separation force levels out at 1.2 mN which can be taken to indicate the ultimate shear strength of the cellulose microfibrils and the point at which the crack accelerates across the fracture plane. All hooks fractured in the region just beneath or at the commencement of curvature. This is in line with shear theory since the material at this point has the smallest cross-sectional area. The innermost fibres experience the highest strain as the hook tries to straighten under loading. The outermost fibres will be in extension as the hook distorts and “straightens” under loading. Once the inner fibres have failed the full load is then transferred to the outer fibres which immediately fail in tension under the significantly higher stress. The inner fibres strain at differing rates. This causes a disruption in the binding matrix. Once the matrix has been disrupted crack propagation is disrupted and the individual fibres that are now unsupported by the matrix rupture in shear and fibre pullout occurs. The crack face moves as the hook bends and then separates because the region of highest stress intensity moves with the hook deformation, staying in the region where the bending moment is the highest. This experiment confirms that the separation force of a natural hooked structure is independent upon the span or radius of a hook and directly dependent upon the component material’s resistance to shear. It shows that the A. minus hook behaves in a different manner to the hooks studied by S N Gorb previously in that there is a negative correlation between hook span and contact separation force i.e. scaling effects. It could be assumed in mechanical design of a hook that the smaller the span of the hook the higher the separation force since this would reduce the tensile stress due to the bending moment. But in micro-sized hooks of composite biomaterials this is not the full story. The bending moment does not add substantially to the direct stress the hook experiences. 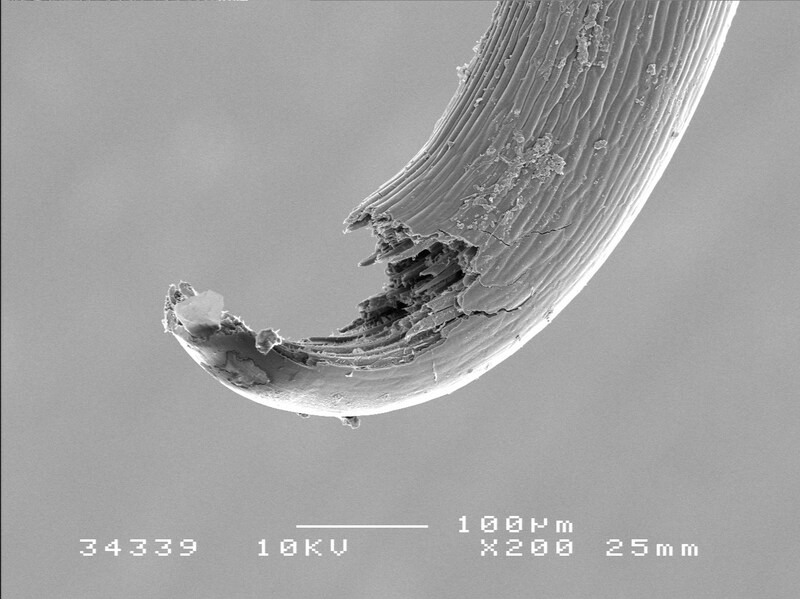 The true weakness can be found in the cellulose microfibril’s relatively low resistance to failure in shear. From Vincent ‎ biomaterials have two types of natural resistance to crack retardation, the Cook-Gordon model where a weak matrix/fibre interface intercepts the crack propagation and absorbs energy of crack propagation and the second is a toughening coating on the exterior of a material. In this test which was performed on an Instron tensile tester which applies load through displacement, the load is not removed or eased after the first crack appears. Loading continues at the same rate (1 mm/sec in this case). There can be reasonable argument put that using a Poisson’s ratio of 0.5 is not accurate. However even of this were so, the results for strain (e) are very low. This experiment helps illustrate the types of properties that shall be important in the specification of a product. It demonstrates (as a biological indicator) that there is a possibility for designing a single degree of freedom hook that mimics A. minus in shape and functionality which would be different from commercial Velcro. It must be born in mind that all the hooks in this experiment as well as in Gorb’s will demonstrate energy efficiency and therefore material and stress optimization in their structure. Further it demonstrates that as a form of biological mimicry, the introduction of vesicles or spaces into the biomaterial matrix could be a valid approach to strengthening a composite hook and that cracks introduced during the process of extension can contribute to the retardation of crack growth.